Real Madrid (Played 13, Points 34) took the initiative in the Spanish league last night as a 4-1 derby success at home to local rivals Atlético de Madrid was sweetened by a defeat to champions FC Barcelona whose 1-0 defeat to Getafe saw them go six points behind los Blancos at the top of the table. Next door in Portugal, SL Benfica (Played 11, Points 27) have provided themselves with a platform to challenge for the title this season by defeating local rivals Sporting by a narrow 1-0 scoreline. In the Estadio Santiago Bernabéu last night local honours were once again afforded to Real Madrid who haven’t lost a league match against Atlético since 1999. The visitors did shock the home support by taking the lead through Adrián after quarter of an hour but that would be as good as it got for Los Rojiblancos who would see their goalkeeper Thibaut Courtois shown the red card for bringing down Karim Benzema in the box allowing Cristiano Ronaldo to equalize from the penalty spot in the 24th minute. The game ended 1-1 at the break but, not surprisingly, Real took advantage of the extra man to stamp their authority on the game in the second half. Goals from Ángel di María, Gonzalo Higuaín and another penalty for Ronaldo, which brought a red card heading in Diego Godín’s direction, capped off a good night for the home side whose 4-1 victory cemented top spot for at least a couple of hours until the result in the neighbouring suburbs of Getafe was known. A good night soon became a great one with the news later on that FC Barcelona had gone down to a 1-0 defeat to FC Getafe and the six point advantage had been preserved. Juan Valera’s goal midway through the second half proved the killer blow for Barcelona who now must look over their shoulder at the oncoming Valencia CF whose 2-1 defeat away to Rayo Vallecano brought los Che to within one point of the champions. In neighbouring Portugal the Lisbon derby was played out with all the usual tension one would expect from a Benfica v Sporting game. The match was settled by Javi García with a goal just three minutes before half-time but it was far from plain sailing for the Eagles who saw Oscar Cardozo sent off for a second bookable offence in the 63rd minute. The win was Benfica’s sixth on the trot against their local rivals in all competitions and allowed them the opportunity to enjoy sole possession of top spot in the Super Liga for at least 24 hours until defending champions FC Porto play at home to Sporting Braga this evening. Benfica have 27 points from eleven games but FC Porto will draw level should they claim all three points tonight. A repeat of last season’s KNVB Beker (Dutch Cup) final, these two oldest and bitterest of enemies meet again in the first Klassieker of the new season. Home team Feyenoord last won this fixture in the 2005-06 season and their success starved supporters will feel that a victory over Ajax is long overdue. They start the game in eighth place, six points behind Martin Jol’s Ajax who, in turn, lie in joint second place with PSV Eindhoven and have the chance to go top of the table this weekend. Ajax have won five out of the last eight matches between the two sides in the Eredivisie and are favourites to win again on Sunday. The most decorated fixture in English football takes place at Old Trafford with both clubs experiencing different fortunes. Manchester United are in third place and unbeaten in the 2010-11 season so far going into this game whilst Liverpool, under new coach Roy Hodgson, have had some teething problems and have only won one of their four matches and lie in 16th place before kick-off. Manchester United still has the whip hand in this fixture having won 59 games to 52 with 43 draws (league game stats only) but Liverpool’s recent record against United is pretty good having won three of the last four matches. The odds, though, are certainly more favourable towards the Red Devils with United expected to gain all three points. Die Königsblauen (Royal Blues) of Schalke 04 have caused controversy ahead of this game by significantly raising prices for visiting Borussia Dortmund fans who, in turn, have threatened to boycott the game in large numbers in protest. On the pitch Dortmund are in good form and have won two of their three Bundesliga matches so far in stark contrast to Schalke 04 who have lost all three of their matches and lie rooted to the bottom of the table. The head-to-head record between these two arch-rivals is close with just one Schalke win (27 wins) separating them from Dortmund (26) and it’s the Gelsenkirchen club who have had the better of it in recent times with six wins in the most recent ten league matches, die Schwarzgelben (Yellow and Blacks) from Dortmund last winning in 2007. OK, so many people would argue that the true Superclásico of Turkish football is the game between Fener and Galatasaray but the statistics show that games involving Beşiktaş are every bit as important as those involving the original Big Two. Beşiktaş go into Sunday’s game three points better off having won three and lost one of their four games thus far in the Süper Lig whilst Fenerbahçe have won two and lost two. In recent years honours have been even in these games with each team winning one each in the last two seasons but the picture overall favours Fener who have won 122 of the 326 matches between them (all competitions) with Beşiktaş just three wins behind. Champions Benfica have struggled domestically this season with just one win and three defeats in their first four matches of the new campaign whilst local rivals Sporting lie in sixth place with seven points. The head-to-head record between these arch local rivals – despite FC Porto’s recent dominance this is still regarded as the biggest derby fixture in Portugal – goes in Benfica’s favour with 168 wins in 401 official matches (all competitions) compared to 153 for Sporting. Last season Benfica got four points from the two league derbies whilst Sporting last had the better of this fixture in 2005-06 when they did the ‘double’ over the Águias (Eagles). Two more important league derbies which take place on Sunday but are not quite of Superclásico status involve the derby of Hamburg between newly-promoted St Pauli and the traditional giants of the city Hamburger SV (kick-off 15:30) whilst across the border in Denmark an important derby in the capital city of Copenhagen sees the defending SAS Superliga champions FC København take on arguably the country’s most famous club Brøndby IF (kick-off 18:00). St Pauli won their opening match of the new Bundesliga campaign away in Freiburg but have lost both their subsequent games whilst HSV hope to jump into second place with a win against their local rivals from the local district of the same name. In Denmark the New Firm take centre stage with Brøndby IF needing a win away from home to stay in touch with their neighbours FC København who come back to domestic action following their 1-0 home win over Russian champions Rubin Kazan in the UEFA Champions League. Although they are seen as favourites to win this game Liverpool FC had better beware the very real challenge from the Portuguese giants of SL Benfica. After all, the last time these two European heavyweights met on the continental stage saw the Eagles of Lisbon turn over the then defending holders 3-0 in the Round of 16 of the 2005-06 UEFA Champions League. In the last round Liverpool FC came back from a 1-0 first leg deficit to dispose of French outift Lille OSC 3-1 on aggregate. Benfica had it tougher against another French side, 2003-04 UEFA Cup finalists Olympique de Marseille, who they beat 3-2 on aggregate thanks to a last-minute winner from Alan Kardec in the intimidating Stade Vélodrome. Since qualification Benfica have savoured domestic cup success defeating arch-rivals FC Porto in the Portuguese League Cup final and then consolidating their lead in the Liga Sagres by beating nearest challengers Sporting Braga. Liverpool, on the other hand, suffered defeat at the hands of their arch-rivals Manchester United before seeing off the challenge of a weak Sunderland AFC team in their latest outing at Anfield. All fans of Madrid’s “other” team Atlético are rejoicing in the fact they are the only side from Spain’s capital city who have a real chance of winning two trophies this season whilst their local neighbours Real Madrid CF ‘only’ have to contend with fighting it out with FC Barcelona for the La Liga title. However Valencia CF have a good recent record in European competition including the famous triumph over Olympique de Marseille in the 2003-04 UEFA Cup final and are seven places higher than Atleti in La Liga. Valencia are in third position in the Spanish League but have no chance of winning it as they are a distant 21 points behind the top two and are hoping for the only remaining silverware available to them. Both of these teams won their Round of 16 matches on away goals, Valencia CF were involved in arguably the tie of the round having drawn 4-4 away to German giants Werder Bremen after the first leg in Valencia had ended 1-1. Atlético were perhaps a tad lucky to emerge from the first leg with a 0-0 draw after Sporting Lisbon had the better chances. There was no arguing with Atleti’s second leg performance though as they took the lead twice before holding out for a 2-2 away draw in Portugal. Since qualification both teams have mixed records of a win and a defeat in La Liga. German football legend Uwe Seeler, known affectionately by the Hamburg locals as “Uns Uwe” (Our Uwe), may have had some luck on his side when he picked the balls out of the draw for the UEFA Europa League in Nyon. Many people feel that HSV have a real chance of reaching the final in their home Volksparkstadion stadium but this would be to underestimate the potential of defending Belgian champions Standard Liège who now only have the Europa League to play for after failing to qualify for the Belgian Jupiler League championship play-offs recently. The fact that Standard have, like HSV, saved some of their better performances for European games doesn’t seem to have registered on many fans’ minds yet and Les Rouches (The Reds) seem more than capable of upsetting the odds on their day. In the Round of 16 they comfortably defeated a Panathinaikos side who had shocked Europe by knocking out Italian heavyweights AS Roma in the previous round. Hamburger SV have also had it tough against Belgian opposition in this tournament scraping through the last round against Belgian Jupiler League leaders RSC Anderlecht by the odd goal in eleven. Since qualification both teams domestic fortunes have not been too good. HSV have lost their last two games against Bayer 04 Leverkusen and Borussia Mönchengladbach whilst Standard’s Belgian League odyssey now rests with participation in the play-offs for a 2010-11 UEFA Europa League place which is available to those teams that finished from 7th-14th after the regular season. Perhaps the biggest surprise in UEFA Europa League this season was Fulham FC’s magnificent fightback in the Round of 16, 2nd leg against Italian giants Juventus FC where they came back from a 4-1 aggregate deficit early in the second leg to defeat the three-time winners of this tournament 5-4 with Clint Dempsey writing himself into Fulham FC folklore with a beautifully chipped goal in the dying minutes of the game. Since then Fulham’s form on the domestic stage has been dreadful having lost back-to-back league games against Manchester City and Hull City as well as suffering FA Cup misery away at Tottenham Hotspur. Defending German champions VfL Wolfsburg have endured a roller coaster ride throughout the season with many an up-and-down feeling as the season has progressed. Die Wölfe (The Wolves) needed extra-time to get past the Russian champions Rubin Kazan in the last round with Christian Gentner scoring a dramatic last-minute winner but this had an immediate effect on their domestic form going down 5-1 at home to Hertha BSC Berlin who have been in last place practically all season. Wolfsburg did recover to win their most recent league match against 1.FSV Mainz by two goals to nil. The first leg of this game took place last night to avoid a clash with Liverpool FC’s home game against Unirea Urziceni on Thursday. Everton have a slight 2-1 advantage going into the second leg thanks to goals from Steven Pienaar and Sylvain Distin. However French defender Distin was sent off late in the game for a foul on Liedson and Miguel Veloso (pictured) was able to pull one back for Sporting from twelve yards out. An intriging return game in Lisbon awaits. This is a game worthy of Champions League status with both clubs sharing six European Cup triumphs between them. Ajax are currently third in the Dutch Eredivisie whilst Juventus are sixth in Serie A. With both teams harbouring realistic ambitions of Champions League qualification next season they may decide to play weakened sides in Europe. Nonetheless this should be a fascinating contrast of styles between two great clubs. The Basque side should have more motivation to progress as the Europa League is the club’s only realistic hope of silverware this season. Anderlecht, one of three Belgian clubs remaining in the competition, comfortably lead the Jupiler League but may find Athletic a tough proposition. Although if the Mauves can get an away goal in the first leg in Bilbao then the tie could be in the balance. The Spanish giants are in good form having reached the Copa del Rey (Spanish Cup) final and beaten Spanish, European and World champions FC Barcelona 2-1 at the weekend. Galatasaray are top in the Turkish Süper Lig, at the moment, and are taking this competition seriously having won it in 2000 becoming the first Turkish team to win a European trophy. With both stadiums expected to be at their intimidating best these two legs won’t be for the faint hearted. Club Brugge haven’t been such a force in Belgian football in recent years having to put up with their big rivals Standard Liège and RSC Anderlecht win the last four league titles. Valencia, despite being a distant third in the Spanish League, have high hopes of winning this competition and are likely to include big hitters such as David Villa and David Silva in order to progress to the next stage. London outfit Fulham FC will have to get a good result at home if they want to progress in this competition as their away record this season is really bad, just one win in thirteen Premier League games on the road. However Shakhtar, the last ever winners of what was the UEFA Cup last season, haven’t played a league match since December as the Ukrainian championship is still in its winter break until February 27th so will be lacking in match fitness. The German side will want to go one better than last season, when they were knocked out at the semi-final stage by rivals Werder Bremen, especially as the inaugural UEFA Europa League final takes place at their home stadium.PSV Eindhoven, currently top of the Eredivisie, are accustomed to the Champions League but have done well in the second competition having qualified for this stage with an unbeaten record so will be a tough grame for HSV. Benfica are huge favourites to advance to the next round. The Portuguese giants are leading the Liga Sagres back home whilst the German capital team are propping up the rest of the German Bundesliga and were in second place behind the other Lisbon giants Sporting in the group stage. The second leg, to be played in Lisbon, will take place on Tuesday, February 23rd to avoid a clash with Sporting’s home game against Everton FC two days later. The Danish champions, known locally as FCK, have played well against big clubs in Europe in recent years but fail to score many goals. FCK will also be lacking match practice as the SAS Superligaen has been in hibernation since early December. Marseille, currently lying in fifth position in Ligue 1, should have too strong a squad and will want to go all the way having lost in their two final appearances in 1999 against AC Parma and Valencia CF in 2004. “Fener” are involved in a title battle with eternal rivals Galatasaray in the Turkish Süper Lig so may decide to rest a couple of players in the two games against a Lille side who lie in third place in Ligue 1, seven points behind leaders FC Girondins de Bordeaux. The Turkish side will be slight favourites as they play the second leg at their intimidating Şükrü Saracoğlu Stadium which hosted the UEFA Cup final last season. Both teams are in the Europa League having finished third in their respective Champions League groups. Liverpool’s recent results have improved even if their performances aren’t always easy on the eye. However coach Rafael Benítez will want to win this trophy for a second time having previously won the title with Valencia CF in 2004. Romanian champions Unirea finished above Scottish champions Glasgow Rangers in their Champions League group but have seen coach Dan Petrescu jump ship to obscure Russian second league outfit FC Kuban Krasnodar during the winter break so may find it difficult against The Reds. The Italian capital side are on fire, at the moment, having gone unbeaten in 14 Serie A matches stretching back to late October and have one foot in the Coppa Italia (Italian Cup) final with a 2-0 semi-final advantage over Udinese Calcio. Panathinaikos, including in-form striker Djibril Cissé, may be top of the Greek league but have stumbled in the last fortnight with their lead now just three points from perennial champions Olympiakos. The Russian side have had a dream couple of years winning back-to-back championships. However they’ve been out of action since the end of November and face a Hapoel side lying in second place of the Ha’Al League. If the Israeli side can sneak an away goal in the first leg then they may fancy their chances against rusty Rubin. This is a fascinating contest between Champions League drop-outs Standard Liège and Red Bull Salzburg, who were the only team to qualify from the Europa League group stage with a 100% record. If Huub Stevens’ Austrian side can get a win in Belgium then expect the second leg to be a formality. However the Liègeois have one of the noisier stadiums in the competition and will make it difficult despite Standard having disappointed in the Belgian Jupiler League this season. Steve McClaren, having taken unfashionable Middlesbrough FC to a UEFA Cup final in 2006, would love to take the Dutch side to the final in May. However Thomas Schaaf’s Werder side will be motivated to make up for last season’s disappointment in Istanbul against Shakhtar Donetsk by taking the short trip to Hamburg and, with their experience, will be favourites to go through. Both teams have massively disappointed in their domestic leagues this season especially Wolfsburg who were surprise Bundesliga champions last season but who currently lie in 11th place this time around. Villarreal’s current form is slightly better, at the moment, and they seem to save their best performances for Europe. This looks like it will be a two horse race between arch-rivals FC Barcelona and Real Madrid. The Spanish, European and World champions FC Barcelona (39 points from 15 games) hold a slim two point advantage over ‘El Real’ whose performances haven’t always been great but whose capability of getting results has improved. Sevilla looked for a while like a potential ‘stalking horse’ candidate for the title, keeping close to the top but they have slipped off the pace in recent weeks. At the bottom of the table newly promoted sides such as Xerez (7 points from 15 games) and Real Zaragoza have found the going tough. A traditional giant of the Spanish game, Atlético Madrid find themselves just one point from the cellar after a string of poor displays. 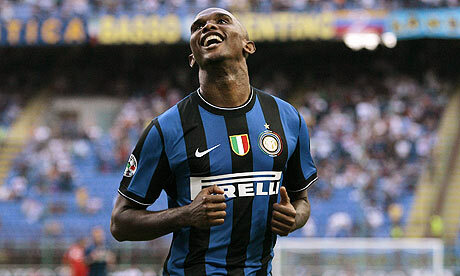 FC Internazionale of Milan (39 points from 17 games), including striker Samuel Eto’o (pictured) find themselves in charge of Serie A yet again. Going for a fifth consecutive championship, the Nerazzurri’s only challengers to date appear to be local enemies AC Milan, who are eight points behind with a game in hand. The Rossoneri have come back strongly after a really poor start under the stewardship of Leonardo. Juventus appeared to be going well under new coach Ciro Ferrara but have lost their last three games and remain a point further behind Milan having played a game more. At the bottom of the league six points separate Udinese in 14th place from AC Siena in last place (12 points after 17 games), signalling that a tight relegation battle could be just around the corner. Bayer 04 Leverkusen (35 points from 17 games) remain unbeaten to be crowned the unofficial “Herbstmeister” (autumn champions) in the Bundesliga. However the ‘Werkself’ (Work’s Eleven) have drawn a lot a games meaning that their lead is a narrow one point margin from nearest challengers Schalke 04, who have done well considering their financial troubles. Despite Bayern Munich’s less than impressive start to the season the Bavarian giants are a further point behind Schalke. Louis Van Gaal has withstood the criticism and has guided Bayern to third place at the halfway stage with 33 points. The surprise of the season so far is 1. FSV Mainz 05, who were promoted from the second division last season, who have a respectable eighth place finish after 17 games. Hertha Berlin is the surprise team at the bottom of the table (6 points/17 games), all the more surprising considering they won on the opening day against Hannover 96. Other big clubs close to the bottom are 1. FC Nürnberg, who sacked their coach Michael Oenning on Monday, and VfB Stuttgart, who replaced Markus Babbel with former Tottenham Hotspur coach Christian Gross in early December. The Portuguese Superliga normally has three contenders for the title but one of this year’s contenders is an unfamiliar one: Sporting Braga. They lead the table jointly with SL Benfica (33 points from 14 games) with perennial champions FC Porto four points behind. Many hope that Braga can keep up with the big two especially since the tradional third power of Portuguese football, Sporting, are struggling domestically (21 points/14 games) but performing well in Europe. Also many remember last season’s surprise package Leixões, who led the table early on in 2008-09, falling away late in the season. Could Braga really become only the sixth club (after Benfica, Porto, Sporting, Belenenses and Boavista) to win the Portuguese championship? At the bottome Leixões’ glory days from last season are well and truly behind them as they now are fighting against relegation lying just one point above the bottom two clubs Olhanense and Belenenses (10 points/14 games). Steve McClaren has done an impressive job at FC Twente (47 points/17 games) thus far and he’s already hoping to go one better than last season. The club from Enschede were runners-up in both league and cup in 2008-09 but McClaren’s men currently lead the Eredivisie by two points from PSV Eindhoven. PSV’s coach Fred Rutten has given new purpose to the Philips owned club after they lost direction last season under Huub Stevens which led to them weakly giving up their run of four consecutive titles. Ajax, coached by Martin Jol, have suffered a few defeats and are nine points off the pace. Their arch-rivals Feyenoord Rotterdam have also been rejuvenated under new coach Mario Been and a further point behind having played a game more. At the bottom RKC Waalwijk (12 points/18 games) will hope to avoid the automatic relegation spot at the end of the season as they are not far off the teams above NEC Nijmegen, ADO Den Haag and Willem II Tilburg. It’s the same old story in Greece as champions Olympiakos Piraeus are involved in a two-way tussle with league leaders Panathinaikos (38 points/15 games) for the championship. As usual PAOK Thessaloniki threaten to make a fight of it but end up dropping too many points but they should easily get a place in Europe. Athen’s third club AEK have struggled for form and consistency in both Greek and European competition thus far and lie in eighth place on 21 points. At the bottom of the table it’s been a dreadful time for promoted Panthrakikos who remain without a win after fifteen games. They have only two points at this stage and are dead certs for the drop. Above them the likes of Giannina, Levadiakos (14 points), Larissa and Iraklis (15 points) will hope to avoid joining them in the second division next season. The Turkish Superlig could be one of the most exciting for years. Fenerbahçe (37 points/17 games) lead at the halfway stage by just one point from eternal rivals Galatasaray. Then there are two unexpected title chasers in Bursaspor and Kayserispor (35 and 34 points respectively) as well as last season’s champions Beşiktaş (32 points). “Fener” will miss on the services of Roberto Carlos after the winter break as he heads back to Brazil to finish his career at Corinithians. Last season’s surprise package Sivasspor struggled in the early weeks of the season but will hope that they can take recent good form into the second half of the season. They are ten points ahead of second bottom Denizlispor (7 points/17 games) and seventeen ahead of Ankaraspor who are pointless (numerically speaking, of course) at the halfway stage and look certain for the drop. Fans of BATE Borisov taunt their opponents Everton on Matchday 2. Everton, however, had the last laugh winning 2-1. Blessed with years of European experience and tradition, Benelux neighbours Ajax Amsterdam and RSC Anderlecht of Brussels easily negotiated their way through this group. Their Matchday 6 match in Amsterdam still had some importance, though, as Anderlecht’s 3-1 win meant that they topped the group on account of a better head-to-head record over their Dutch challengers, both teams finishing on eleven points. Dinamo Zagreb were optimistic of further progress earlier in the competition as they had three points from two matches but they failed to build on their good start. Champions League Play-Off losers FC Timisoara scored a respectable five points on their maiden Europa League campaign but still finished fourth in the group table. Valencia secured qualification and the top spot on Matchday 6. They went into their game away at Genoa needing only a point to be certain of going through to the last 32 whilst hosts Genoa needed all three points to finish at least second. With the game tied at 1-1 in stoppage time, David Villa was gifted the ball from Genoa goalkeeper Alessio Scarpi to secure the victory in the 94th mnute. Elsewhere Lille’s 3-1 win at home to Slavia Prague ensured that they finished second, two points behind the leaders. Slavia, who have dominated the Czech league in the last two seasons, have been struggling domestically this season and this form was transferred into Europe as they remained without a victory after six games. Israeli side Hapoel were the surprise winners of this group finishing two points ahead of German giants Hamburg. Their Matchday 6 encounter in Tel Aviv ended as a 1-0 win for the hosts and it was they who leapfrogged “HSV” into first place. The biggest disappointment of the group were Scottish club Celtic who were unable to re-create their many great European nights under new coach Tony Mowbray. Among the highlights of the group were the encounters involving Celtic and Austrians Rapid Vienna, whose little known rivalry dates back to a controversial European Cup Winners’ Cup second round match in 1984-85. Both games ended drawn but the Matchday 6 encounter would’ve felt like a win for the Glasgow giants as they came back from 3-0 down after 18 minutes to draw 3-3 with virtually the last kick of the game and demote their Austrian hosts to last place. The only team who finished their campaign with a 100% record was Austrian side Red Bull Salzburg suggesting that they could be a good outside bet to go far in the competition. Huub Stevens’ men beat all challengers home and away to finish a clear nine points ahead of second place Villarreal. Italian capital side Lazio frustrated their followers as they could only win two of their six games and finished three points behind the little Spanish village team. Bulgarians Levski Sofia fared little better than their local rivals CSKA (see previous blog) finishing bottom with three points. Steve McClaren’s FC Twente were looking comfortable after two games but then nearly blew their qualifications chances. After Turkish side Fenerbahce secured the leadership of the group, FC Twente were relying on them to do them a favour on Matchday 6. Twente needed a win away at 1986 European champions Steaua Bucharest but could only manage a 1-1 draw in very cold, frosty conditions played in front of a sparse crowd. However the surprise team FC Sheriff from Moldova had to win against the already-qualified “Fener” to grab the second spot but the Turkish team did McClaren’s a favour beating the Moldovans 1-0. 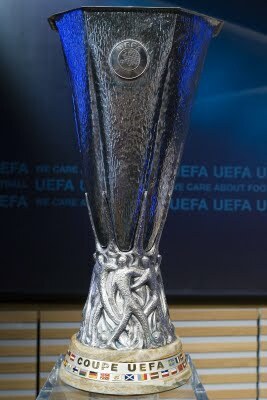 No surprises in group I were Benfica and Everton went through to the Round of 32 with one match to spare. Benfica, in particular, showed their class in their two matches with nearest challengers Everton scoring seven goals without reply in their two games (5-0 at home and 2-0 away). The Merseysiders, however, did progress thanks to three wins out of four against their eastern European opponents, the only defeat coming on Matchday 6 at home to Belarussian champions BATE Borisov but Everton were already through to the next round and played a very young team on the night. Benfica finished top with 15 points (only a shock defeat away at a very poor AEK Athens denied them a 100% record), Everton scored nine points, BATE avoided the wooden spoon scoring seven points compared to AEK’s four points.